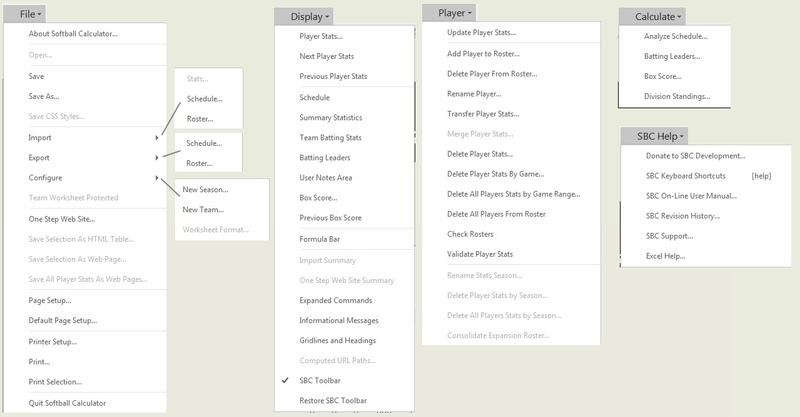 The SBC is an Excel-based application that facilitates management of the statistics for a team. The source for the batting stats can be a game scoresheet or imported from a 3rd party app. Schedules can be entered and maintained either manually or imported from an external file. The computed results can be printed. A web site can be automatically generated with a single command with no web authorizing knowledge required. Single season stats con be merged to maintain career stats. The SBC is controlled by a set of menu commands. A basic set of commands has been chosen for simplicity of use and should be sufficient for the vast majority of users. Keyboard shortcuts for several commands are available. A list of these combinations is available via the SBC Help menu or by pressing the help key or toolbar button. An expanded command set can be activated for additional capabilities and web site customizations. A custom toolbar contains commonly used operations. When running the SBC under Excel 2007 or newer versions on Windows with the Ribbon Interface, the SBC menus and toolbar appear as fixed items under the Add-Ins tab. On Excel versions without the Ribbon interface, the toolbar will appear as a floating toolbar.